Now mutable widths available, 16", 18" and 20" widths at no extra charge! 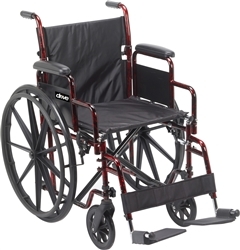 Includes 24" rear MAG wheels with flat-free tires and 8" flat-free front casters. Standard Fixed-Arm Wheelchair is everything one needs in a traditional wheelchair. Armrests are always going to be a major concern when considering a wheelchair, and the KN-800T comes equipped with fixed, padded, full-sized armrests for comfortable and secure positioning. Fold-down removable backrest (unscrews into two pieces and folds down or can be removed). Standard swing away leg-rests - Smooth-rolling latex tires. Solid rubber tires mounted on composite wheel provides durability and low maintenance. It's easy to transfer patients in and out of the wheelchair due to its flip-up desk style armrests that improve the wheelchair's accessibility. Desk-length fixed-height padded armrests - Powder coated silver vein steel frame. 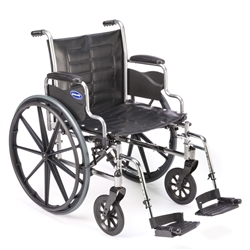 The Tracer SX5 from Invacare is one of our most popular wheelchairs. 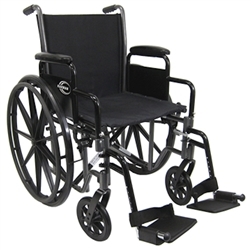 Great features such as dual axle positions, 8" solid rubber casters and durable black nylon upholstery. 250 lbs. & 300lbs. 34 lbs. Great buy with removable swing-away footrests, dual axles standard and a 300 lb. weight capacity. It has fixed full-length armrests standard, with the option to upgrade to desk-length flip-back arms. 16" - 18" 300 lbs. 38 lbs. 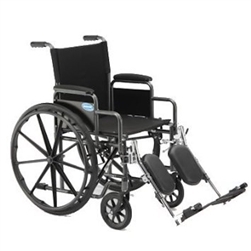 Standard manual wheelchairs are the most frequently sold wheelchairs. 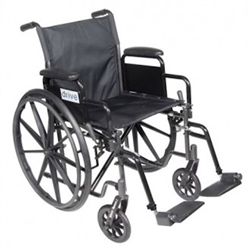 Standard wheelchairs by design typically weigh over 35 pounds, most have a seat width and depth between 16" and 20". Options include elevating legrests and fixed or detachable armrests. 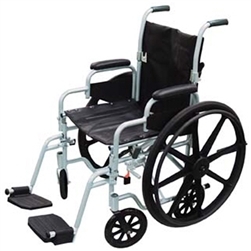 Need a lighter weight wheelchair to load and transport? 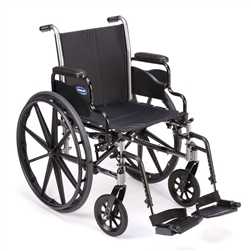 Check our line of lightweight wheelchairs.